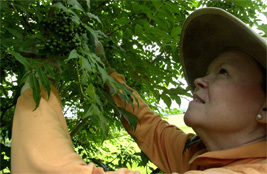 Jean Giblette checks ripening fruit of Phellodendron chinense. Photo: Robert Ragaini, Hudson Valley Newspapers. James A. (Jim) Duke, Ph.D.
Edith Lee, R.Ph., L.Ac., M.T.O.M. Robert L. Newman, L.Ac., M.S.T.C.M. High Falls Gardens is a small farm supporting a big idea – the restoration of authentic plant medicine to North America. After many years of growing Chinese medicinal herbs and networking with like-minded people, we are now part of a larger organization. HIGH FALLS FOUNDATION INC. is an independent nonprofit organization founded in 2008 to carry on our mission of education, research and conservation of medicinal plants. We invite you to join us, in our own special niche of the Great Work. Please strengthen our base with a contribution, sign up for our emails, and tell us about your interests. All gifts are fully tax-deductible and gratefully acknowledged. If you prefer to mail a check, please click here and print out our donation form. High Falls Foundation supports LocalHerbs.org as a service to the national network of growers of Chinese medicinal herbs. We sponsor the Eastern Forest Chinese Herbal Medicine Consortium, groups of clinicians and growers cooperating to grow Chinese herbs in eastern North America. The Foundation and High Falls Gardens have provided educational programs in botany, horticulture, agriculture, ecology and conservation for students and practitioners of Chinese herbal medicine since 2000.